Welcome to United Adhesives, Inc.
United Adhesives Inc. formulates and manufactures special adhesives for applications in aerospace, automotives, computers, cellphones, electronics, semiconductors, and telecommunications. We are headquartered in Illinois, USA, at 85 Oakwood Road of the Industrial Park of Lake Zurich with a manufacturing floor plant, a quality control and development lab. Over the last 10 years, we have been recognized as a global quality innovator, manufacturer and supplier of over 200 unique adhesive products including, but not limited to, the bonding adhesives, protective coatings, encapsulants, potting gels, sealants, thermally conductive adhesives, electrically conductive adhesives, and optical adhesives, etc. They are widely used for various electronic, semiconductor, and optoelectronic applications over the world. We are proud of that all our products are developed and manufactured in the USA. They are Made-In-USA brands!. Our adhesives are based on three major chemical categories: silicone, epoxy, and fluorocarbon. - The silicone adhesives, including thermally conductive, electrically conductive, heat cure adhesives, and RTV cure sealants, provide low-stress bonding and coating with high and low temperature stability. - The epoxy-based adhesives, including electrically conductive adhesives, high temperature, low CTE, and capillary flow underfill encapsulants, provide structural bonding strength, high temperature stability, and chemical resistance. - United Adhesives also provides innovative solutions for optoelectronics with optical-grade epoxies and silicones. They are applied in bonding and potting fiber-optic cables, connectors and terminations, LCD backlighting, displays, traffic and other lightings, upgrading the vibration and shock resistance of electro-optic assemblies, cementing and coating optical parts, potting LED devices, optical replications, and coating or encapsulating a wide variety of optoelectronics. fluids. Click here to view our complete product lists. Beyond the manufacturing, our research and development team of United Adhesives is also operated in Chicagoland, USA. United Adhesives has its sales site and customer support team located in Eastern China. 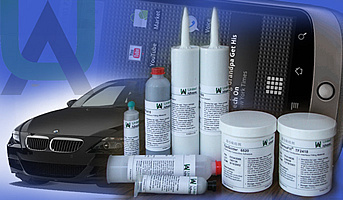 United Adhesives focuses on challenging technologies in electronic industries and producing custom formulations. We assure our customers the highest quality in adhesive products through a dedication to product performance, reliability, specifications, and timely delivery. We are committed to distinguishing ourselves as a reliable and responsive adhesive company for our global customers. Together, we will win the future!